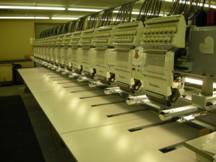 We have the highest quality equipment and maintain it on a regular basis. We also employ experts in the field of apparel decoration so you can be assured of the best service and appearance of your order. We hand inspect every order before it is shipped to you to make sure no mistakes have been made. Our 6-point quality assurance program makes sure that what you ordered is exactly what you want – every piece, every time! We have available to us more than 700,000 promotional items. We can locate just about whatever you want. In some cases, we can have an item custom made for you. In terms of apparel, there are thousands of colors, fabrics and styles available. You get high quality on a wide variety at a lower price in less time. What more could you want?